Published in the South Kent Gazette, 18 June, 1980. The next important work began about the year 1838. The initiative was taken by Lieut Worthington, RN, who advocated an enlargement of the accommodation by building a tidal dock outside the harbour, at the back of the North pier. His scheme was rejected, and the Commissioners enlarged the harbour inside, by the removal of the York Hotel, the Amherst Battery, the Dover Castle Hotel, and other buildings. This gave a sheltered area of five additional acres, and left the -tidal harbour in extent as it now is. That work was completed in 1844, and two years later the Wellington Bridge and gates were built, affording admission to the Pent from the tidal harbour. The bridge gates, which cost £7,000, were opened by the Duke of Wellington. The formation of the quays, from Union Street up to the top of Northampton Street, another important work of the last century, will be described in subsequent pages. Prior to 1834, the passage along the side of the Pent, at the back of lower Snargate Street, was only available for foot passengers, and it was called Pentside. The building of Commercial Quay, and the widening of it for a road, was completed in 1834, and about the same time the quay on the opposite side was built, at the back of the Esplanade. The Slipway was made in 1850, and in 1852 was commenced the work of cleansing the Pent, the building of Northampton Quay, the arching over of the Dour, and the completion of Northampton Street up to new Bridge. These works completed the inner harbour. A new Harbour Board was constituted in 1861, and that Board being deprived of the revenue from Passing Tolls, the finances did not permit of any important works being undertaken for several years. In 1871, the 5ft deepening of the inner basing was commenced; and when 'that was completed, and some additions made to the quay walls at the north end of Custom House Quay, it was re-opened and re-named the Granville Dock. The dock Tower was built about the same time, and improvements made in the Wellington Dock quays, the entire cost of the works from 1871 to 1879 amounting to £77,416. In 1888, the Wellington Dock gates were widened to admit the larger Channel steamers. The Wellington bridge as built in 1844, was replaced in 1904 by a massive steel bridge, swung by a combination of hydraulic and electric power, to carry both the roadway for vehicular traffic and the railway to the liner landing-stage on the Prince of Wales Pier, and that completed the development of the harbour inside the north and south piers. It will be here of interest to record the names of the principal Harbour officials at various periods. The names of Clark and Thompson, two Masters of the Maison Dieu, who helped to obtain Royal aid in the reigns of Henry VII and Henry VIII, have been frequently referred to. Henry VIII, in his great works, had John Walley for his surveyor and overseer. The first actual Commission — a temporary one — was formed in 1581, consisting of Lord Cobham, the Lord Warden, and nine other members, as above mentioned. They were all local men, residing in Dover, or in the country round. That Commission ceased to exist after the works on which they were employed were completed, and a permanent Commission was formed by the charter in 1606, the members of which were the Earl of Northampton (Lord Warden), Sir Thomas Fane (Governor of the Castle), George Bing (Mayor), Sir Francis Fane, Sir George Fane, Sir John Boys, Sir Thomas Hartfleete, Sir Edward Boys, Matthew Hadd, and William Monyng. 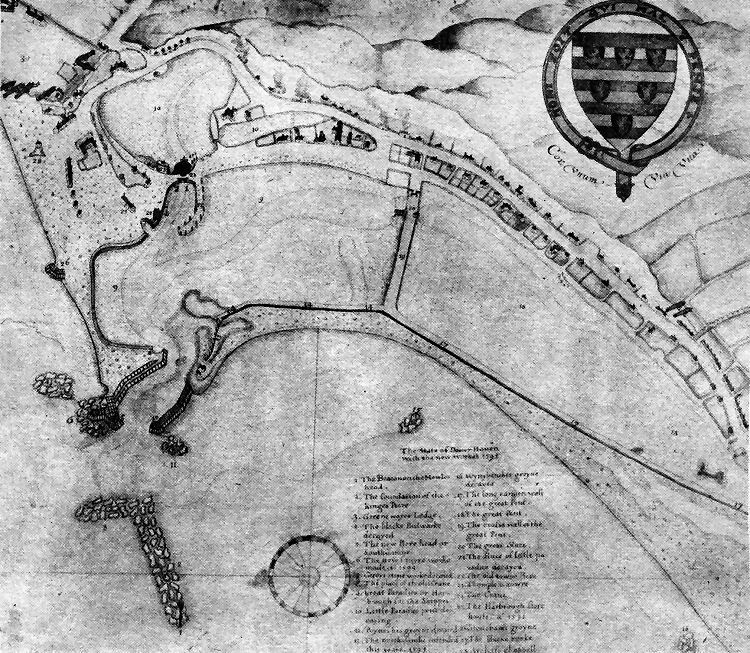 An old plan of Dover In 1595. It shows the Little Paradise Pent (10), the newly formed "Great Paradice“ (9) a tidal harbour Inside the North and South Pier heads (12 and 5) with the Great Pent, now the Wellington Dock (18) protected from the Inroads of the sea by Thomas Digges’ celebrated Pent wall, 1,980 ft long and separated from the tidal harbour by the 660ft long crosswall (19) now known as Union Street (centre). These two walls were built In a little over three months, a remarkable feat, using the same methods used to reclaim the Bomney marshes. Of Digges’ work William Minet wrote In the early 1920s “He Is the founder of modern Dover, for the Wellington and Granville docks and the tidal basin are ail the result of his work, and, without his Pent wail, Dover would have lacked its esplanades and Marine terraces, now the foremost attraction to Its visitors.“ Up to the date of enclosing the Pent the town had virtually stopped at SnarGate. Top left Is Archciiffe Fort. An 1829 engraving of the tidal harbour looking towards the Crosswall and Custom House Quay based on a drawing by W. Westall.